Of course, we’d love to have no maintenance, lightweight doors like many folks in our community have upgraded to, but the budget doesn’t permit that right now. So, after about 5 years of enduring all types of harsh weather, the doors were looking pretty beat up, with paint pealing in many places. We were short on time before wood rot would begin to take hold and we’d be looking at a much bigger repair or replacement than the cost of repainting. 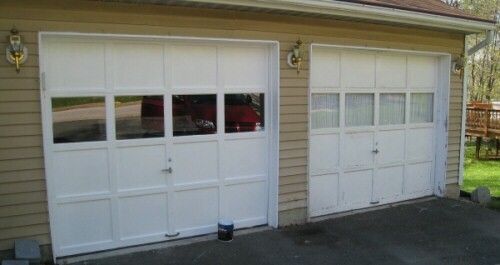 Here’s a picture of the two doors before the job. You can see that the paint has worn away on some of the jambs, and the doors themselves are looking a little rough. Besides the obvious aesthetic value, repainting the doors also ensures that moisture can’t penetrate the front of the door and into the wood. Untreated wood will eventually become loose and break down, and will slowly wear away. If allowed to stay wet over time (for instance when wet leaves pile against the bottom of the door), wood rot can set in, destroying the door’s integrity. Step 1: Sand away all loose paint and wood chips, especially loose paint around the window panes. We used our Milwaukee Orbital Sander, our new Rockwell Sonicrafter, and a hand sanding block that Gator sent to us. For the orbital sander, we used hook and loop sandpaper that Gator provided, available at most big boxes. As expected, it worked great. A note on sandpaper grit: You want to sand with no harsher than 50 grit paper, and we recommend using an 80 grit, even if it means changing paper more often. Garage door panes are not usually solid wood. Ours were fiberboard and the goal should be to minimize the amount of fiber you expose. The Sonicrafter is great for detail work, but we only had 120 grit paper for it, so it wasn’t ideal for taking down big sections of the door. It was useful, however, for getting to places were an orbital sander has trouble. After the sanding, the door looks even worse than before (which makes the painting process even more rewarding…) Note, however, that while the door looks bad, it’s actually pretty smooth if you run your hand across it, which means its ready for painting. We chose Behr Exterior Satin Paint in Bright White. We’ve had a good experience with Behr Exterior Paint on some deck railings we painted last year that have held up nicely for the last 12 months. We’re hoping to see at least 3 good years out of the paint before we have to readdress those railings, or these garage doors. Our doors face east and are on the North side of our house. They only receive about 5 hours of sunlight per day and much of it is at a steep angle. A south-facing garage might see as much as 16 hours of sun in the Summer, putting an exterior paint to the test. Step 2: Apply one coat of paint and let it dry. We used a 4 inch mid-grade paint brush to apply the paint all the way around the door, being careful to achieve full coverage. Tips: (1) It’s easier to paint the bottom of a garage door if you lift the door half-way so that you’re painting at arm-level. Most garage door openers will stop half-way up if you tap the open button mid cycle. 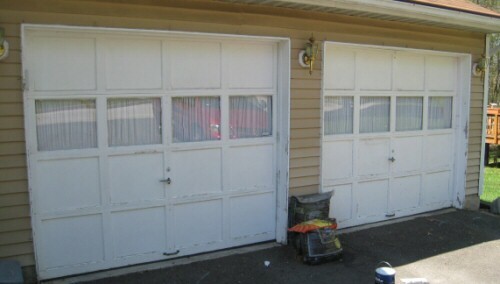 (2) Open the garage door at least once mid-way through painting to ensure the door doesn’t stick where the paint has dried. Step 3: Apply a second coat of paint. Step 4: Use a razor blade to clean excess paint off of the windows. Unfortunately, I didn’t get a shot of this during the project, but we use a scraping-style razor-blade holder. You can find them at any of the big boxes, Walmart, and a few other stores. Here’s a side-by-side after one door has had two coats, and the other hasn’t been touched. Note that we’ve decided to take the sheers out of the windows, opting for the reflective look that reduces privacy but provides a nice contrast in the doors. How Often Should you Paint a Garage Door? From start to finish, the total effort was about 6 hours – about 3.5 hours on the first door and about 2.5 on the second. Sanding is the biggest and messiest part of the job, but is essential to a good, long-lasting finish. You should paint the door as often as is necessary to keep the finish in good shape. 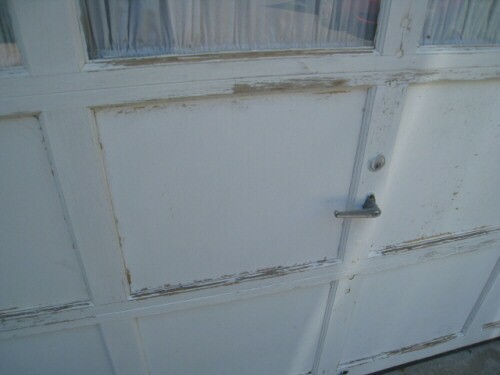 Once paint starts to peel or flake, you should immediately sand and re-coat the door to preserve the wood. Remember that if your house was built prior to 1978, the garage doors could have at least one layer of lead paint on them. You should use caution when addressing these doors. For contractors, there is a new law surrounding lead paint that Todd recently told us about over on HCI. Well, this is a timely post! I will be tackling our solid wood garage doors shortly as well. They are old, from 1937 and still are in great shape. However, the paint is worn clean off in many spots and I can’t wait to redo them. Interesting that your other commenter mentioned the lead paint, I was considering picking up a tester because I’m quite sure that at least one of the layers on the doors contain lead. Your doors look great, I’m thinking of using the Behr Exterior Premium Plus paint and primer in one, I’ve had good luck with the interior version. Thanks for the nudge to get my own doors painted! Thanks for the reminder. I started this project late last summer and didn’t get finished with it. 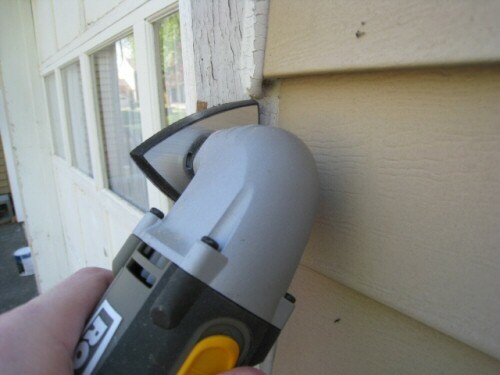 However, we do have wood rot on our garage doors, so I was repairing the wood. Next step will be to paint. 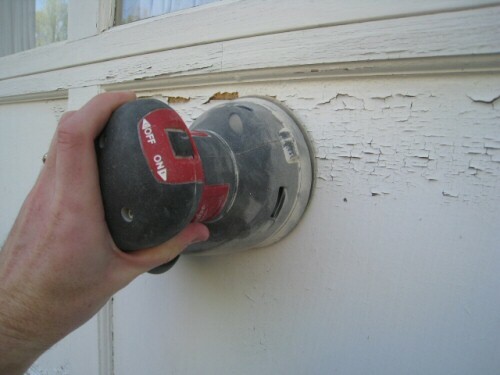 derek – paint scraper is indeed a good solution for peeling paint – one issue we didn’t mention here was that its hard to get the orbital sander into the corner of the panes. We used a hand block sander to cover this and the scraper may have worked better. The Sonicrafter would have also done a great job had we had 80 or 50 grit paper for it. Thank you for this post! I have been telling my husband its about time to paint ours & now he can’t tell me he doesn’t know how! It doesn’t look like you primed the bare wood after sanding. Shouldn’t this be done? or isn’t it necessary? Pamela, primer can help hide imperfections and may improve wear over time; however, we felt that with the doors painted previously and the added cost of priming, it was worth skipping. 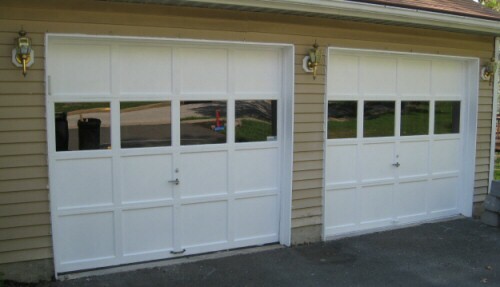 Hi – I’m planning on painting my garage doors but they are aluminum – any special tips for painting non-wood garage doors? I have fiberboard doors too. They fell apart when I sanded them and never became smooth. I solved this problem by “painting” the fiberboard portions of the door with a 2 to 1 water and wood glue mixture. Problem solved. Great tip, Eddie. Thanks for stopping by and for adding it. I love the way you renovated your garage. one more thing to put on the list… I have to stop reading these posts or I will never get off the couch! 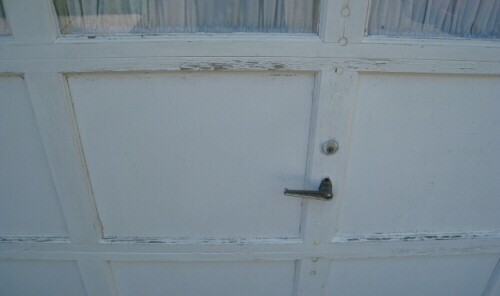 Hi, I have removed the paint with a heat gun and sanded the door , my question is should use a brush or roller the prime/paint the wood? Both. Brush for tight spaces and roller for large ones. My wife repaired some areas of wood rot, then used an oil- based paint. That paint is peeling now about 3 yrs. later, and the lower panel has broken/ buckled. Anyone know of a safe way to repair the lower piece, which actually isn’t a full panel. I am thinking of using a pressure- treated 2x6x16′. Suggestions? Lot’s of good information here… the finished product looks great!